Prostate cancer begins when cells in the prostate gland start to grow uncontrollably. The prostate is a gland found only in males. The prostate is a gland located in the lower urinary tract, under the bladder and around the urethra. Prostate cancer can grow and spread quickly, but mostly it grows slowly. The chance of having prostate cancer rises rapidly after age 50. Prostate cancer occurs more often in African-American men than in men of other races. Having a father or brother with prostate cancer more than doubles a man’s risk of developing this disease. The risk is much higher for men with several affected relatives, particularly if their relatives were young when the cancer was found (younger than age 65). Men who eat a lot of red meat or high-fat dairy products appear to have a slightly higher chance of getting prostate cancer. These men also tend to eat fewer fruits and vegetables. Obese men have a higher risk of getting more aggressive prostate cancer. Smoking has been linked to increased risk of dying from prostate cancer. Firefighters can be exposed to chemicals that may increase their risk of prostate cancer. Inflammation of the prostate gland may be linked to an increased risk of prostate cancer. Problems urinating, including a weak or interrupted urinary flow, pain while urinating, inability to urinate, sense of incompletely emptying the bladder, intense need to urinate, or the need to urinate more often, especially at night. Early prostate cancer usually causes no symptoms. More advanced prostate cancers sometimes cause symptoms. In most cases, symptoms are caused by benign prostatic enlargement, or an infection. Because of this it is important that you see a doctor to understand what causes the symptoms. 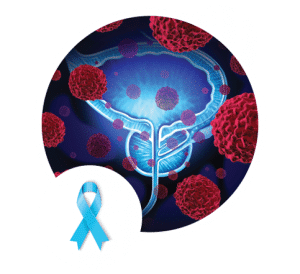 Prostate cancer can often be found early by testing for prostate-specific antigen (PSA) levels in a man’s blood or the physical exam of the prostate gland. If the PSA level in your blood is too high or abnormal physical exam of the prostate gland, this suggests that the cells in the prostate are behaving unusually. This could be because of a tumor in the prostate, but also because of an infection or a benign enlargement of the prostate. Age 50 years for men without family history of prostate cancer, non-African American race, and without symptoms of prostate cancer. Age 45 years for African Americans men or men who have a first-degree relative (father, brother, or son) diagnosed with prostate cancer at an early age (younger than age 65). Age 40 years for men who have more than one first-degree relative who had prostate cancer at an early age. At any age if there is warning symptoms of prostate cancer. Your doctor will use the test results, together with your age, your medical history of warning symptoms of prostate cancer, and your family history of prostate cancer, to estimate the risk of you having prostate cancer. If the risk is high, you may need a biopsy of prostate tissue. This test is done to confirm if you have a tumor or not. Men who are regularly physically active have a lower risk of prostate cancer.